Do Men Really Need Skin Care Routine? I’m just a regular guy that showers daily and that’s the only time I wash my face and body. It’s time-consuming enough to groom my hair and beard that I couldn’t care less what my skin looks like. Guess what I gained by not taking extra care? I had a breakout worse than when I was in my teens. Like most adults, I’m confident I already got past that stage and left it all in my teenage years. At first, my pimples weren’t really an issue but over time I became self-conscious especially when I go out and meet people. It feels like they’re not staring at you “You” but at the zits proudly sitting on your face. What I really hate most about my pimples is they’re itchy and painful at the same time. Do I really need a skin care routine? Well, what option do I have to solve my dilemma? So it’s definitely a yes! After doing some research and consultation, I tried a skin care routine that works for me. Skincare for men should be easy and straightforward. There is no need for five-step peels or multiple layers of creams. However, not all skin care products are created equal and could probably be harmful to your skin. The simpler approach to skincare the better. Men are prone to blackheads and clogged pores mostly on the nose and forehead area. Splash warm water on your face or even take a shower to open up your pores to allow the dirt out before applying a facial cleanser to your face for 30 seconds in a circular motion. Remember, wash your face not more than twice a day and do not use soap that contains chemicals that are too rough for the face to prevent dryness. 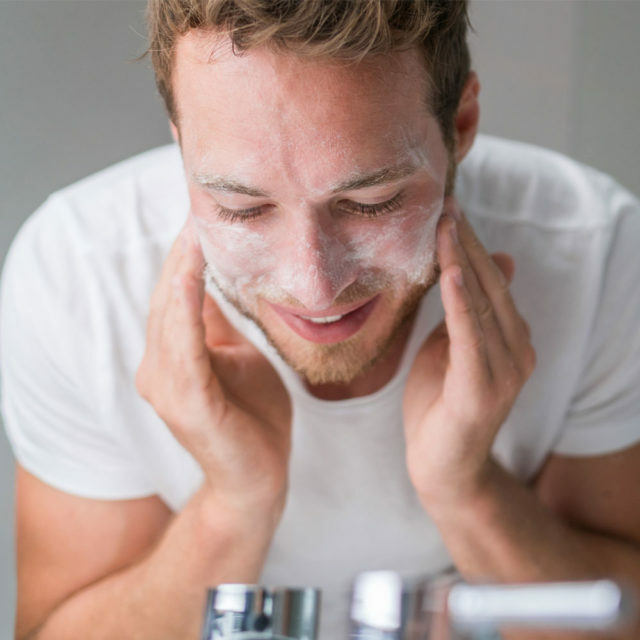 Like with face care, men’s body care starts with a hot shower too, which opens up pores, allowing dirt and bad oils to be easily eliminated either using soap or a body wash. But for dry skin, the use of body wash is recommended as they usually have more moisturizing ingredients than a regular soap. No matter what season, dry skin can affect anyone. Using a moisturizer after showering helps your skin look good, prevents aging, and reduces oil production. So, it’s time for you to select a product that matches your skin type, to keep your skin hydrated and healthy. It’s time to include a little sun protection into your routine. Too much sun exposure can lead to fine lines, wrinkles, dark spots, and even cancer. It is important to keep skin protected by using sunscreen with SPF 30 is recommended to protect the skin from sun damage.